Fifteen days after twin suicide bombings killed 76 people in Kampala, Uganda, President Yoweri Museveni used an African Union summit in the capital city to declare war on the Somali group responsible for the July 11 bombing -- as well as on foreign fighters aiding the group. 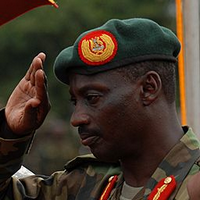 "The terrorists should be wiped out of Africa," Museveni said on Monday. "Let us act and sweep them out of Africa and to where they came from in Asia and the Middle East."